Competitive cycling is rapidly on the rise in South Africa due to the passion, drive, and vision of one man Bonga Ngqobane. Bonga Ngqobane is a 27-year-old social entrepreneur who is passionate about youth and community development. His dream and primary goals are: to affect lives in a positive way, help others find their dreams and make them come true, to mentor and coach others to become professionals on and off bikes, and to create a space where young people feel welcome and where they belong. So how did Ngqobane get his start? He said his passion for cycling began in the dusty streets of Khayelitsha, a partially informal township on the outskirts of Cape Town, where he grew up. After school, Bonga would rent a bicycle from a friend using the pocket money he was supposed to spend on lunch and snacks at school, so he could go riding in the afternoons after school let out. One day he saw a black cyclist ride past the school and felt both shocked and super excited to see a black cyclist. That very day he followed the cyclist’s tracks to a clubhouse where he immediately inquired about enrolling. That was in 2005 and since then Ngqobane has continued his love of cycling and taken advantage of opportunities to compete on all levels from local to provincial to national as a junior and semi-professional rider for the ACSIS and G-Velokhaya professional teams and even thou himself didn’t get a chance to compete internationally but he got an opportunity to coach and manage SA U/23 National team international elite races a career highlight for Ngqobane was when he participated in the Absa Cape Epic, one of the largest and most televised mountain bike events in the world, where he finished in the top 200 with his partner. To put that into perspective, the Absa Cape Epic hosts 650 top two-person professional and leading amateur teams from all over the world for an 8-day, 700-kilometer (roughly 435 mile) race that climbs 15000 meters (~49213 feet) over an “untamed” landscape. In addition to riding, he has also professionally managed two South African national level cycling teams. When I asked him if he still competes, he said, “I still do but not at a highly competitive level anymore due to injury” which brings us to the academy he founded in October 2014 to fulfill his dreams beyond cycling. 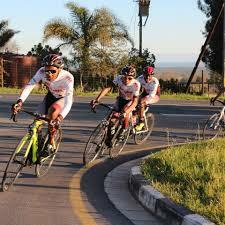 With his partners, Ngqobane founded the Bonga Cycling Academy with the express aim of changing the perception that cycling is only for the elite and to bridge the gap by increasing the number of black cyclists in “Le’ Poleton” a French term for the main group or pack of riders in a road bicycle race. Ngqobane added they have made significant progress on the later goal and their academy riders are doing very well in local races. When I asked about alumni of the academy, Ngqobane shared that three notable alumni, Ntandazo Koyo, Masibulele Nikani, and Siphamandla Poto all graduated from their program as pro riders and have since gone on to join a pro team in Pretoria, Sampada cycling. Another notable academy rider is Sifiso who is currently completing 12th grade and plans to attend university next year. He concluded his shout-outs with Coach Lubabalo, formerly a rider who is now working with the academy as a manager and coach and in his final year as a science student at the University of Western Cape (UWC). Ngqobane has many plans for the future of the academy and the first step, “is to develop a center for young people where they feel at home, safe, and happy … a place of sport and education where life seems to have a positive direction. The team would also like to further establish a pro team to give the academy’s best athletes the opportunity to fully explore their talents and potential.” The academy is also busy setting up a string U/17 and Junior team that seeks to take their young riders to the next step. Considering that Ngqobane is only 27 himself, I am very excited to see where he will go in the future both personally and professionally and when I asked him about his own plans for the future he said, “Our youth are at risk due to social ills, politics, and the economy, therefore they need mentoring and life coaches. Let’s all unite in making a different where we can, let’s not do it for money. Let’s change lives and make a difference in our societies.” I couldn’t agree more. I would like to also take this opportunity to thank all my sponsors who has made this journey possible, special thanks to THE ANSWER SERIES, DATADOT SA and individuals who keep supporting us on daily bases and special thanks to Dave Eddie Snr who has been our number one supporter and sponsor.